Take enough yoga classes and at some point you're bound to hear your teacher give a shout-out to the psoas (or, when paired with the iliacus, “iliopsoas”). If you're lucky, you might even show up one day to find that your teacher has themed an entire class around the psoas (this is really a lot cooler than it might sound, I promise!). So why are yoga teachers so enthralled with the psoas? Can learning more about it really enhance your yoga practice? What's so fascinating about this muscle anyway (besides the fact that its name is ripe for anatomy puns: “Psoas I was saying…” That's yoga comedy gold, right?). 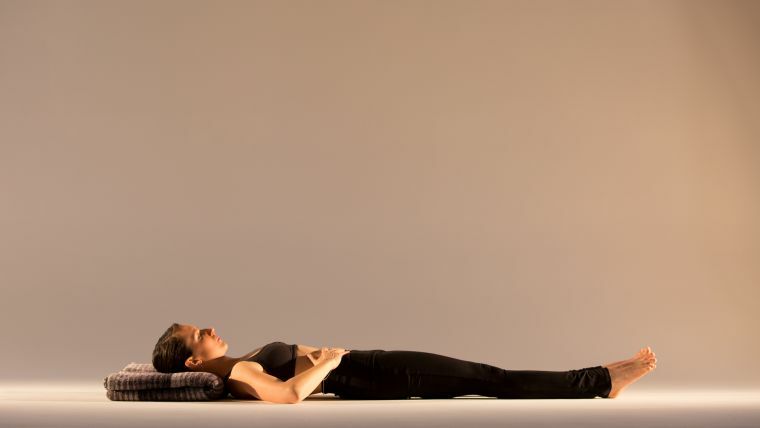 Ida Rolf famously referred to it as the “seat of the soul,” but on a less esoteric level, the psoas is known for being a hip-flexor, meaning that when it contracts, it brings the pelvis and thigh closer together, making it a key player in many of our favorite asanas (and more mundane activities like walking). But that's not all! Heck, that's not even its main job! The psoas actually has a lot more to do with your spine than your hips. The psoas (when functioning optimally) supports the healthy alignment of the lumbar spine, meaning it plays an important role in maintaining good posture. And when it's not functioning optimally, it can be a major culprit behind back pain and discomfort. But before we get into more about what the psoas does, it's useful to learn a little something about where it is. The psoas actually has a lot more to do with your spine than your hips. The psoas major is a paired muscle (that means you have two of them, one on each side) that lies deep within your body. It's actually the deepest skeletal muscle in your body, perhaps adding to its mystique! It originates at the very last vertebra of your thoracic spine (T-12); attaches to all of your lumbar vertebrae; meets up with the iliacus muscle (hence the common “iliopsoas” moniker, even though these are really two separate muscles); crosses the front of the pelvis; and then the psoas and the iliacus together attach at the lesser trochanter, which is at the top of the inner thigh. Because this muscle has attachments at the spine and at the inner thigh (the upper body and the lower body), it's quite complex, and it can be kind of a challenge to work with during yoga practice—but it's also a lot of fun to work with. I've found that developing a deeper understanding of this muscle has helped me to gain a stronger understanding of my practice (especially when it comes to integrating the upper body and the lower body), and to better understand and address my limitations and frustrations when it comes to my less-than-favorite poses (like backbends of the “reach over your head and grab your foot” variety, which can be extra-challenging if the psoas muscles are tight, “grippy,” or otherwise out of balance). Plus, gaining not just “book knowledge” about the psoas, but an actual “felt sense” of it in relationship to my yoga practice is, honestly, pretty empowering. And that's kind of what yoga is about, right? Exploring, experimenting, and getting to know ourselves better. For years, first in ballet class and later in yoga, I remember being called out for my “over-archy” lower back (i.e., my anteriorly tilted pelvis and excessive lumbar curve). I was often told that this was a sure sign of a “tight psoas.” (Is it? Maybe. There's actually a really cool little test called the Thomas test that a trainer or therapist can do to help you figure it out.) I was also often instructed to “tuck my pelvis” or “scoop my tailbone” as a means to correct this, something that we now know is not, for most people, the best way to address a “super-archy” lumbar spine. Here's the thing: Because the psoas is such a long muscle, it can act as its own antagonist. How cool is that? The lower fibers of the psoas work more to bring the spine into hyperextension (meaning that “archy back”), and if this part of the psoas is tight, it may indeed manifest as an excessive lumbar curve. The upper, outer fibers work a little more with lumbar flexion (the opposite action). The key then, when working with the psoas, is to move toward balance. This means activating our deep abdominals so that the psoas doesn't have to work so hard. In this scenario, the psoas can “ungrip” (more on that later!) and when we stretch it, we do so in both directions. Stretching the psoas doesn't mean tucking your tailbone under and pushing your pelvis forward—sure, you might feel something of a stretch, but ultimately, it's not going to be a very balanced or effective stretch. Start by lying on your back. You can place a pillow or folded blanket behind your head and neck for support. Keep your legs neutral (not turned out or in), feet a few inches apart—about as wide as they would be if you were standing in tadasana (mountain pose). Point your feet and spread your toes to activate the muscles of your legs. Often when we do abdominal work we unnecessarily tug on the psoas, but if we engage the deep core muscles and spine stabilizers, then the psoas doesn't have to work so hard and can let go of any “gripping” or tension that it may be holding on to. Still in supta tadasana, place your hands on your “hip points” (frontal hip bones, or anterior superior illiac spines) and on an exhale, engage the muscle between them (your transverse abdominis), drawing the hip points toward one another (If you notice any actual movement here, it will be slight). Keep that engagement as you breathe (you'll notice the movement of the breath primarily in your rib cage and upper abdomen here, as your lower belly is working). Lift your left heel just an inch or two away from the floor, and then lower down and do the same thing on the right. Aim to keep your hip points level as you continue to lift and lower one heel at a time. After you've played with that a little bit, slide your hands up so that they're just above your hip points. Press down and see if you can feel your psoas engage here as you continue to lift and lower one heel at a time while working to keep the pelvis level and stable. Again, perhaps, noticing if you observe any nuanced differences from side to side. And then, just for contrast, keep your hands pressing down, and lift your right leg up quickly, without the deep abdominal engagement. You may sense a “gripping” feeling, like a tugging on the psoas. That's what you want to avoid, and that's what deep abdominal engagement and slow, mindful movement helps to counteract. Then (just so you end this exploration on a “positive” note!) reestablish the engagement between your hip points, and lift and lower your heels one at a time, slowly and mindfully, a few more times. Next, return to supta tadasana, place your left hand behind your head, bend your right knee in toward you, and hold on to the back of your right thigh. Press your thigh into your hand and your hand into your thigh for stability. Curl your head and shoulder blades off of the floor and gaze toward your low belly. Draw your belly in, and round your back. Narrow your pelvic points, engaging your transversus abdominis, to prevent your psoas from taking over. Engage between your pubic bone and navel to activate the more superficial abdominals (rectus abdominis). Then lift your left heel an inch away from the floor. See if you can lift just your upper body a little higher. Stay here, or, if you want more challenge, stretch your right leg out to meet your left one and hug your thighs together. Stay here for a breath or two, then release down. Take a full breath in and out. Here's a simple exercise you can do anytime, anywhere to help you ungrip and move toward a happy psoas. Then, lift the hip point of your hanging leg so that it's level with your other hip point; your two frontal hip bones should be level. Narrow your two frontal hip bones toward one another. Also engage between your pubic bone and navel. Then, keeping your hip points level and an engagement in your deep low belly, gently swing your free leg back and forth. If you have a friend nearby, you can ask them to initiate the movement for you with a gentle push. Keep the support in your belly, and let your leg swing like a pendulum. Avoid swinging your upper body back and forth. Next, step off the block and notice how you feel. Does the leg that was swinging feel longer? More relaxed? More awake and active? After doing just one side, you may also notice a sense of gripping in your standing-leg hip. Do the other side, pause, and notice how you feel. How many times have you heard that anjaneyasana is a great stretch for your psoas? And it certainly can be, but there's a little more to it than just coming into the pose and pushing the pelvis forward—at least if you're looking for a safe, balanced stretch. Instead of pushing the pelvis forward, try this: Back out of the lunge a little bit, and engage between your hip points, drawing them toward one another and allowing the psoas to ungrip. Move your thighs back, especially your back thigh; even lift your back inner thigh up. Keep that, and lift up through your low belly a bit (so that you're not collapsing onto your front thigh). Then you can sink a little deeper into your stretch; stretch your legs apart from each other, like you're stretching your mat in two, and reach up through your arms. Envision your psoas lengthening in both directions as you stretch down through the legs and up through the spine. Enjoy a few breaths here, then repeat on the second side. For many students, parshvakonasana can feel uncomfortable. It's common to feel “bound up,” restricted, or tight in the front hip. 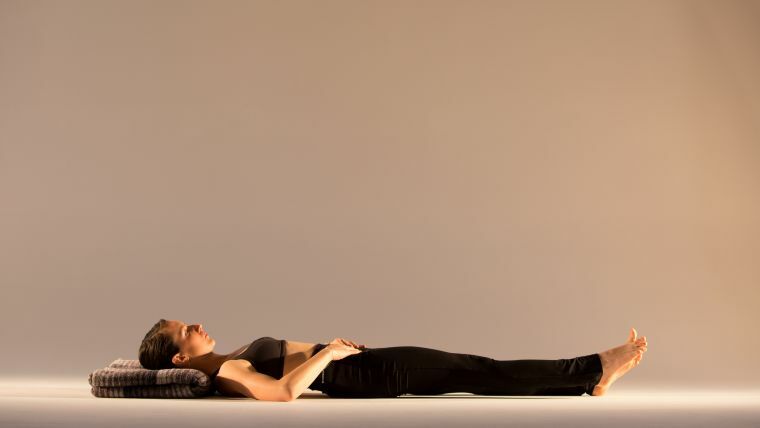 Often, a tight psoas can be the culprit, and working with many of the same actions described above can make the pose more comfortable and accessible. Come into a warrior II position, facing the long edge of your mat with your left foot forward, front knee stacked over your front heel, and your back toes pointing straight toward the long edge of your mat (or slightly turned in). Bring your fingertips onto two blocks, shoulder-distance apart, set up at their highest height on the inside of your front foot. Press your fingertips down into the blocks (you may discover that just by pressing down with your fingertips, you get a nice core engagement), and (you guessed it!) draw your hip points toward each other. Keep that engagement, and lift your left heel up off of the floor, coming onto the ball of your foot. Press into the ball of your left big toe, and, keeping the ball of the big toe rooted, move your knee toward the pinky-toe side of your foot. As you move your knee out toward the pinky toe, keep your hip points drawing toward one another, the left side of the belly wrapping toward the right side of your belly. Keep those actions and stretch out through both of your legs (think “stretching the mat in two”) as you lower your left heel down. You might just feel a nice sense of opening where you normally feel “bound up” in this pose! Then you can stretch your top arm up, or alongside your ear, and enjoy what might just be your most comfortable parshvakonasana ever! Press back up, and repeat on the second side. 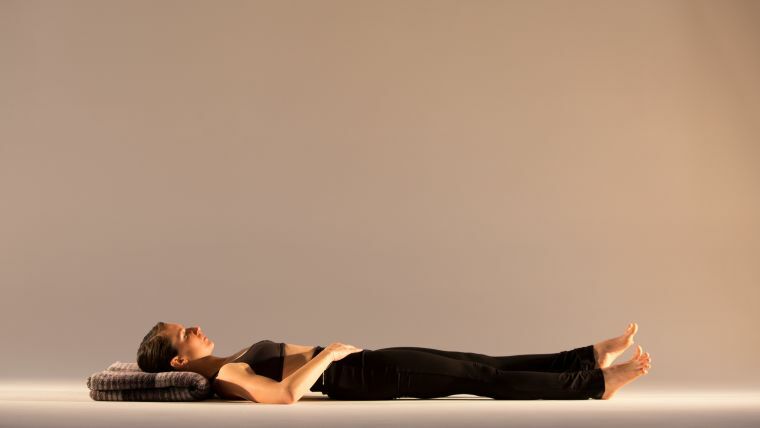 You can practice this sequence on its own (and finish with a lovely shavasana!) or include it as part of a longer sequence.